Explore a next-generation CRM system of intelligence designed to transform student engagement. Recognizing the complexity of the student journey—from enrollment to graduation and beyond—has been driving new ideas about CRM. 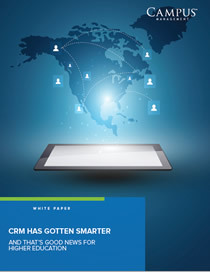 This newly published white paper from Campus Management says the future of CRM is here, delivering new insights into student interactions across the institution so that faculty, student services, and administrators can provide the right level of support to help students achieve their goals.